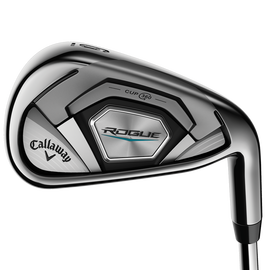 This Is How Distance Should Feel Rogue Irons are the best combination of distance, accuracy and playability ever in a Callaway iron with our 360 Face Cup and VFT, multi-material construction, and Urethane Microspheres. Rogue irons combine our renowned 360 Face Cup technology with Variable Face Thickness (VFT) technology to expand the portion of the face that delivers fast ball speed. Face Cup employs a shallow, flexible rim around the perimeter of the face that flexes and releases at impact to increase ball speed. VFT also influences how the face itself flexes to promote more ball speed on off-center hits. The combination of these two technologies promotes ball speed and distance. Tungsten Weighting allows us to position the CG in each of the long irons with extraordinary precision, promoting optimum launch and control at each individual loft. The tungsten, twice as heavy as steel, concentrates significant weight into a small space in the form of an intricately shaped part, which is key to precisely controlling CG location. The upside of a thin clubface is faster ball speed and more distance, the downside is excessive vibration that generates an unpleasant sound and feel. Urethane can be used to dampen vibration to improve sound and feel, but it can also greatly reduce the face’s ability to flex, lowering COR and ball speed. Our elastic-urethane microspheres provide the sound and feel benefits of urethane without compromising COR or ball speed.